Not much really. Toggles the visibility of the taskbar when clicked. 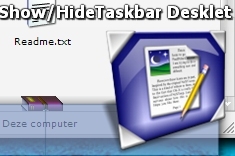 Might be handy when you want to quickly access the taskbar for the tray icons or something. Is their a hotkey I can use to toggle this other than actually clicking on the icon? syntax to do it via VB? I'm writing a script to toggle a view things at once when I hit a certain button.